For the 2004 SPLOST, however, the county still has spent only about 90 percent of the revenue projected and only a little more than 86 percent of the revenue actually collected. The unspent funds from the 2004 tax are for county facilities expansion and renovation. The county has spent only a little more than $1 million of the $4.6 million it had promised to spend for that purpose, a discrepancy that shaped discussion as the commissioners prepared for SPLOST 2015 and is likely to surface again in newly initiated conversations about county space needs. The annual Report on Projects Funded Through Special Purpose Local Option Sales Tax is required by state law and provides a rare glimpse for the public into what the county is doing with revenue from the tax. The report has to be published by the end of the calendar year and covers the period through the end of the last fiscal year. Since Oconee County has not spent all of the revenue from the 2004 tax, the report covers both the 2004 SPLOST and the 2009 SPLOST. Voters approved SPLOST 2015 on Nov. 4, and that tax will go into effect on Oct. 1 of 2015, which is three months into the next fiscal year, meaning that next year’s report will include the SPLOST expenditures for the 2004 and 2009 tax but not 2015. The Board of Commissioners was asked by Chief Superior Court Judge David Sweat to include $25 million in the 2015 SPLOST for construction of a new judicial facility, but the Board decided to pass over that request and spend $2.7 million from SPLOST 2004 for a security fix at the existing courthouse. Commissioner John Daniell was particularly critical of the county during the SPLOST 2015 discussions, saying that by not spending money allocated in 2004 it weakened its hand in requesting additional revenue for the same purpose in SPLOST 2015. The county has taken no visible action on changes to the courthouse since those discussions earlier this year, and Daniell prodded his fellow commissioners last month to start open discussions about the future of the courthouse and of space needs generally. Commissioners Margaret Hale, Jim Luke and Mark Saxon were supportive. In the last fiscal year, which ended on June 30, The county spent only $38,051 from the $4.6 million allocated for county facilities expansion and renovation in the 2004 SPLOST, and has spent only $1,010,854 since the tax started in 2004, according to the recently released report. The county spent $33,000 from 2004 SPLOST to renovate space in the Government Annex so it could lease space to the United States Department of Agriculture. With excess collection and interest on money collected, the 2004 SPLOST is now budgeted to spend $26.4 million, rather than the initial $25 million, but the county has not put any of he excess revenue into facility expansion and renovation, according to the report just released. Revenue for SPLOST 2009 is running behind expectation, with the current estimate that the tax will generate only about 80 percent of the expected $40.4 million. SPLOST 2009 revenues are split between the county and the four cities in the county, with the county originally expected to get just less than $34.7 million. The current expectation is that, when the tax expires on Sept. 30, 2015, it will have generated around $28 million for the county. As of June 30, the county had spent $20.5 million, or just less than 74 percent of the expected revenue. All four of the cities had been allocated 80 percent of the expected revenue. Because the county has concluded it will not reach the expected $34.7 million, it has argued it can reallocate funds within the categories given to voters when the BOC approved the referendum for SPLOST 2009. The county has spent 83 percent of the expected revenue for payment of the debt on Veterans Park and 106 percent of the expected revenue for payment of debt on the jail. It has spent only a little more than 2 percent of the expected revenue for water and sewer facilities but nearly 97 percent of the expected revenue for roads, streets and bridges. The report shows spending for communication facilities exceeded even the original projection, while spending for recreational, historic and scenic facilities was only 27 percent of the 80 percent projected, and spending for farmland protection was only 49 percent of the expected revenue. Spending on fire station facilities and equipment was at 61 percent of the 80 percent projection. Water and sewer spending has been slow as the Utility Department builds revenue for upcoming large projects, including a new sewage treatment plant on the Middle Oconee River. Earlier this year the BOC took $2.1 away from the 2009 SPLOST allocation for water and sewer projects and added that money into SPLOST 2015, reflecting that deferred need. The BOC used the $2.1 million from SPLOST 2009 to pay off the debt on the jail so it would not be a part of SPLOST 2015. The county is required to complete the annual report on SPLOST projects, and this year’s report was completed on Dec. 12, a Friday, according to the date on the document. I asked for a copy of that document through an open records request I filed at 8:05 a.m. on Monday, Dec. 15. 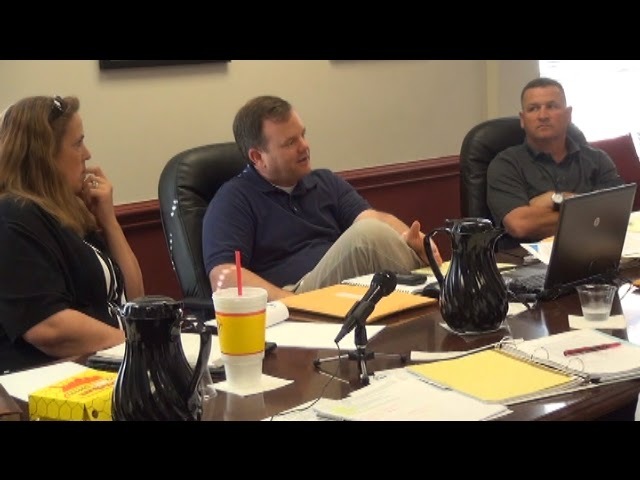 The request was directed to county Finance Director Wes Geddings and was acknowledged by County Clerk Jane Greathouse, the county's open records officer, at 8:26 a.m. The county did not make the document available to me until just before noon on the 17th. By law, the county has three days to respond to open records requests, though it is not required to wait three days to do so. The document provided to me is available here. No public record exists showing running totals on detailed SPLOST spending or a list of projects for which SPLOST monies have been used. Note: The county is required to publish the report on SPLOST projects in The Oconee Enterprise, the legal organ for the county. The report appears at the bottom of page A3 of the paper's Dec. 24 edition. That same edition, on page A5, contains the report by the Board of Education on the 2006 and 2012 Education Local Option Sales Tax. The county put the report on its web site on Dec. 29. The unspent tax funds from the 2004 brings up a simple question: Is the Melvin Davis/Jeff Benko administration competent? Why should they be trusted to spend future SPLOST funds when so much left is from 2004 and 2009? Also and even more important, can they even be trusted? Why do I ask? Because they refuse to share SPLOST spending figures openly with county residents!!! It's 2014; why isn't all SPLOST info. on the county website in an easy to access and read format? It's easy with almost no cost to do so. There is simply no excuse not to have info. on our tax dollars ready for public view. I'm guessing this goes against the basic tenets of conservative Republicans and Tea Party members. Why trust a government that won't share basic info. on how it's spending our tax dollars. I agree with the previous Anonymous commenter, and I am also tired of these new SPLOST votes coming up ("oh yes, this is something we MUST have") when they have not even used (needed???) all of the money coming in from YEARS AGO!